To set up a double boiler, add some water to a large saucepan and bring to a simmer. Place a heat-resistant bowl on top of the saucepan. Add egg yolks and white wine to bowl and whisk together until sauce begins to thicken and become creamy. In a slow and consistent stream, add melted butter to egg yolks and whisk until sauce has thickened and doubled in volume. Remove bowl from heat and add some Tabasco to taste, along with salt, pepper, and lemon juice. Stir thoroughly until sauce has a smooth consistency. In a large saucepan, bring some water to a boil. Add some white wine vinegar, bay leave, and juniper berries. Reduce water to a simmer. Poach eggs for approx. 3 - 5 min. Carefully remove from water and set aside. Cut bread roll in half. Spread a dollop of Hollandaise onto both sides. 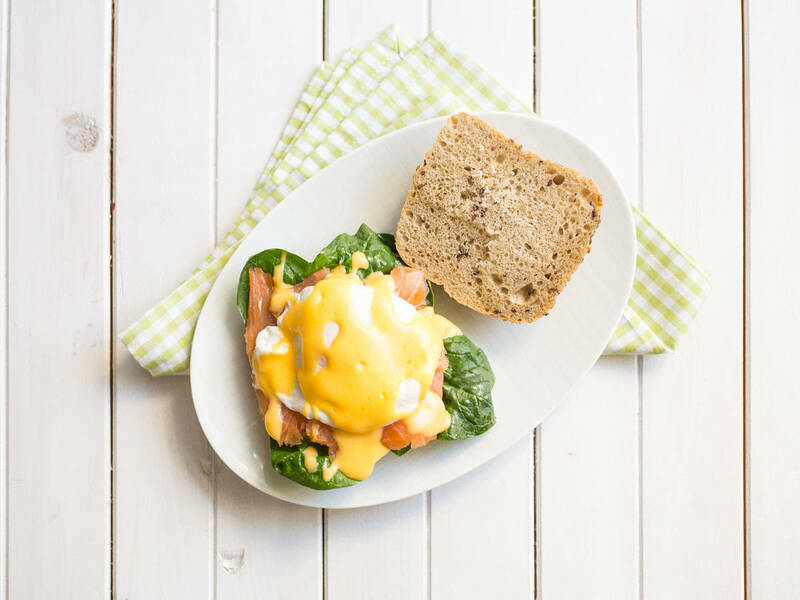 Layer bread with spinach, salmon, and egg. Top off with more Hollandaise. Enjoy!